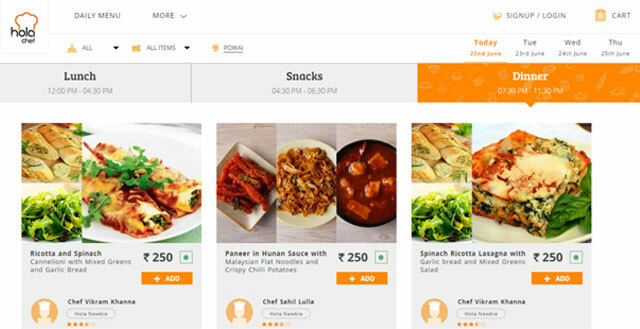 Mumbai-based food technology startup Holachef has secured Rs 20 crore (about $3.1 million) in a Series A round of funding led by venture capital firm Kalaari Capital. Holachef's existing investor India Quotient also participated in this round, according to a press statement. The startup will use the funds to invest in infrastructure and technology. "The investments will help us in fueling our infrastructural expansions that will enable better preparation & delivery of food. This will help us penetrate deeper into Mumbai as well as other cities in India," Saurabh Saxena, who founded Holachef along with Anil Gelra in 2014, said in the statement. Hoachef had raised about Rs 2 crore from Anand Lunia-led seed-stage fund India Quotient in February this year in the form of convertible notes, which refers to short term debt that converts to equity when a startup raises Series A funding. Holachef delivers home-cooked food to consumers. It offers select signature dishes, about 50 choices everyday, and delivers them to users. Each meal is priced at Rs 120 to Rs 350 and serves one person. At present, the start-up claims that it is serving 1,000 orders a day across locations in Central and Western suburbs of Mumbai, and received about 65 per cent of its total orders through the mobile app on Android and iPhone, while the rest came via its website. It does not have any physical presence yet. Vani Kola, MD, Kalaari Capital, said: "We are excited to be investing in Holachef. The team has a deep passion to offer great food and commitment to customer service. These are the ingredients to create a great company. We believe food tech will be a large opportunity in India." The food tech space in India is currently one of the hottest segments with a few companies raising funds from VC firms, while many more startups getting launched with several innovative business models, as per VC funding data from VCCEdge, the data research platform of VCCircle. Earlier this month, Bangalore-based Bundl Technologies Pvt Ltd, which owns and operates online food ordering startup Swiggy.com, has raised Series B funding of $16.5 million (around Rs 102 crore) in a round led by Norwest Venture Partners (NVP) for expanding its geographical footprint and brand building. Also, Delhi-NCR-based Bite Club raised Rs 3 crore from Powai Lake Ventures and angels such as Aneesh Reddy of Capillary Technologies, Ashish Kashyap of Goibibo Group and Alok Mittal of Canaan Partners. In February, food technology and delivery start-up YuMist raised about Rs 6.2 crore from venture capital firm Orios Venture Partners. The biggest deal in this space was that of TinyOwl which raised Rs 100 crore in its Series B round from Matrix Partners, Sequoia Capital and Nexus Venture Partners, while Foodpanda raised $110 million for its global plans. Holachef Hospitality Pvt. Ltd. India Quotient Fund Kalaari Capital Advisors Pvt. Ltd.